Vehicle Warning Lights Are Used For Storm Emergencies, Salt Spreading And Other All-Weather Applications Requiring High Visibility. Vehicle Warning Lights are available in a variety of types, sizes and shapes to suit job applications, vehicle specifications and lighting requirements. Utility light options include Warning Lights, Light Bars, Emergency Lights, Strobe Lights and Revolving Safety Lights Shapes, sizes and colors vary per model. Vehicle warning lights are available from several trusted brand names. LED Road Flare has a Magnetic Base that Easily Attaches to Metal Surfaces. 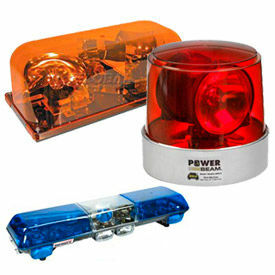 This LED strobe/flare is ideal for any vehicle and handy to flag down tow truck or police vehicles for help. The lithium rechargeable or replaceable battery light includes 9 flash patterns. Magnetic base for easy attachment to metal. Waterproof and durable. 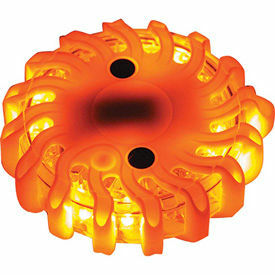 Styles are Round Rechargeable Strobe/Flare Kit and Strobe Light. Volts are 12, 4.5, 3.7, and 1.4. Colors are amber or orange. 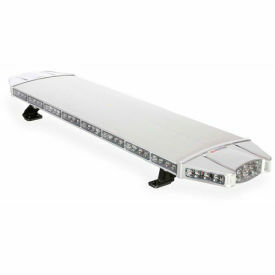 LED Equipped Light Bars Enable Low Power Consumption For Lighting Applications. LED Equipped Light Bars have an exterior frame made with a double-layer polycarbonate to provide long lasting durability. Gen 4 1 WATT LED technology provides powerful light illumination any direction. LED modules and flasher boards are epoxy coated and fully encapsulated for waterproof and weather proof use. Modular lens design is also waterproof. Mount kit types include Magnet and Permanent for securing light bar. Wattages range from 32-360. Available light colors are Amber, Amber/White, Blue, Blue/White, Green, Red, Red/Blue, Red/White and White. Electrical Specification: 24 Volt / 9 amps at peak.